In all of my recent projects as a consultant, a microservice architecture was selected to reduce the interdependency between business functionality by organizing services around business capabilities. In these projects, JSON over HTTP (in a more or less REST-ful way) is usually the first choice for inter-service communication. Don’t get me wrong! JSON is absolutely fine for many use cases, being a human readable data interchange format with a wide range of adoption. But especially in high-performance environments or for pure machine-to-machine communication, there are more concise and efficient alternatives. One of them is Protocol Buffers. Protocol Buffers is a language-neutral and platform-neutral data interchange format for encoding structured data, developed by Google for internal use and made publicly available in 2008. As of this writing Protocol Buffers is released in its version 3. Now let’s see what Protocol Buffers can do for us compared to the common solution of using JSON. In the context of this blog post I present an example application that exposes a REST endpoint, which is producing and consuming messages in the binary protobuf format. Kotlin is used as the programming language of choice. Although Protocol Buffers does not provide a native support for Kotlin (yet! ), the interoperability of Kotlin and Java comes in handy here. The microservice itself uses the well-known Spring Boot framework for defining and exposing the REST endpoint. By the way, if you are uncertain why anyone would ever want to program in Kotlin, please take a look at the blog post of my colleague regarding 7 things any java developer should know when starting with kotlin. (Deployment) Targets specify the staging environment in which the specific deployment will be performed (from development to production stage). This defines a message type DeploymentEvent with fields denoting the technology type to deploy, the artifact version, the target environment and so on. The DeploymentsEvents type is the list analogon in Protocol Buffers. Each field of a message is assigned a unique field number to identify it in the binary representation. Message types start with index 1. Enum types start with index 0 and the enum value at index 0 is treated as default value, so Protocol Buffers will omit it in the binary representation for efficiency. Similar to other serialization frameworks (Apache Thrift, Avro, …), the message format will have to be compiled into a target language first. In our case this will be Java instead of Kotlin due to the lack of support from Protocol Buffers. For our compact example the generated class file is already over 2000 lines long, which can be a problem for resource-constrained systems. For mobile apps you might want to depend on the Protobuf Lite Runtime instead. Take a look at the protobuf-gradle-plugin GitHub project for an example gradle file to set everything up for the Protobuf Lite Runtime. One of the sad points of missing native Kotlin support: No data classes are created, with which one can work so comfortably in Kotlin due to named parameter instantiation, copy constructor and auto-generated equals, hashCode and toString methods. To be able to use these generated sources directly, the main.java.srcDirs directive adds that folder to the sources of the project. Overall, the project build is very straightforward. 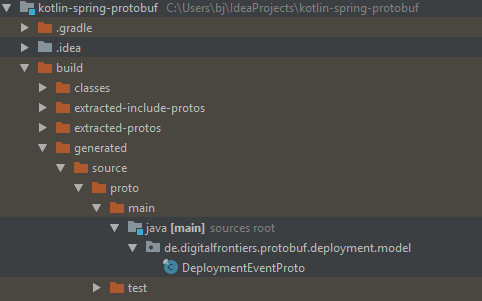 Executing ./gradlew build in the project root folder generates the protobuf sources first and compiles the kotlin classes afterwards. The Spring Framework makes the implementation of the REST controller very simple and convenient. The only difference to a JSON-based REST Controller is setting the content type to application/x-protobuf. The serialization and deserialization of binary protobuf messages is encapsulated by Spring as long as the content type for the methods is set correctly. Otherwise Spring assumes application/octet-stream, which is just raw binary data that is not interpreted any further. Not very helpful in our case. Due to the great support of Protobuf by the Spring Framework, the controller tests can be written quite easily. Here, MockMvc is used to test the web layer, Mockito for mocking dependencies away and AssertJ for its nice fluent assertion API. JUnit 5 is chosen as the underlying test framework. This test verifies that serializing and deserializing protobuf messages in the controller is indeed working as expected and the content types are setup correctly. For a real microservice architecture, we would have one or more services that act as a client of the provided REST endpoint. For some fast testing, cURL is absolutely sufficient. Of course, the cURL command is somewhat more complex than with a service that understands JSON, but the call to protoc is always the same. I’d say that’s a justifiable expense. On the subject of trying out the service: An in-memory database is filled with a few initial events, so you can play around with the application directly. For more examples, just take a look at the project README.md file. Using a binary format for service-to-service communication is quite straightforward with the chosen technology stack of Protocol Buffers, Kotlin and the Spring Framework. In terms of network transfer size, protobuf messages are about 4 times smaller than even compressed JSON files. With its wide range of supported languages and platforms, Protocol Buffers is in my opinion a real alternative to the otherwise omnipresent JSON (I won’t even mention SOAP here). Maybe this blog post could convince some of you to choose a binary data exchange format for inter-service communication. Since using them is not complicated at all, this would at least be my first starting point for reducing network latency and gaining faster communication. Thanks to Joachim Baumann and Frank Scheffler.